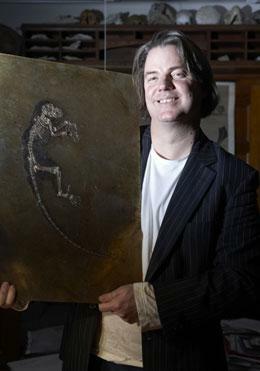 Jørn Hurum has accompanied the fossilized primate he nicknamed Ida on a world tour to fame and notoriety in the last week. The 47-million-year-old fossil is famous for its haunting completeness — the outlines of its fur and its last meal appear like a shadow around the intact skeleton. Yet Hurum has drawn fire for promoting the fossil and its potential links to human ancestors through a multi-platform media campaign alongside the release of a scientific paper that describes the fossil’s genealogy more modestly. Today, he and Ida paused in London to discuss the fallout of the publicity and the next scientific steps. The book, the television programme and the press releases make claims that are not necessarily spelled out in the peer-reviewed journal article. What response do you have for critics who argue that your approach distorts the scientific process? I don’t think a discussion of haplorrhines [tarsiers, apes, monkeys and humans] and strepsirrhines [the suborder of primates comprising lemurs and lorises] would be easy in popular science. You need to simplify it down to more understandable words. Of course in that you lose a little bit of the scientific terms, but really I think the message is very, very much the same in what we are doing popularly and scientifically. There are many competing theories about how early primates fit together. What would it take to persuade other palaeontologists that Ida is closer to haplorrhine than strepsirrhine ancestors? The three-dimensional reconstruction of the foot. That will be very, very obvious what it is when we do it. That will be solved this summer with new three-dimensional models of the whole structure. The CT [three-dimensional computed tomography scan] was only made from the skull. The other thing we’re doing now as we speak is to scan plate B. We will make a three-dimensional model of the ear bones and they’re also very different in strepsirrhines and haplorrhines. These two things will happen hopefully within a year. I think we will settle a lot of the discussion with these two structures. When will researchers outside of your group be able to examine the fossil themselves? Already we’re discussing two different papers with different new researchers. The way to get access to good specimens in palaeontology is usually to get in contact with the researchers working on it and suggest cooperation. At the same time what we have done already is of course to place casts in the American Museum of Natural History [in New York] and the Natural History Museum in London, and we’re going to place one in Senckenberg Research Institute and Nature Museum [in Frankfurt]… so it will be possible to study the outer morphology of the specimen from the casts within a few months. Before we publish on it, we’re not going to release all the CT stuff, of course. That’s kind of the database for our research for a few years now. Do you feel that there’s any kind of ethical responsibility to allow scientists to see new scientific results before publicizing them so they can prepare their responses to the media? No. No. What we did is really to tell our story also in a popular format at the same time as we did a peer-reviewed paper, and that’s not illegal. If there’s a phylogenetic claim and it’s corrected in future publications, does that not hand ammunition to creationists? We cannot wait several years to tell the story just because it might be corrected. This is science. Higher-rank phylogeny is something that is extremely volatile. It changes with different authors. This will jump around cladograms for the next ten, fifteen years, I’m sure. But it will never be difficult to say that this is an important specimen. Did you offer it to any other journals before it was accepted by PLoS ONE? No. Phil Gingerich had a very good experience with PLoS for his Maiacetus paper in February so he was the one suggesting PLoS. How important was it to put all the media elements together in one piece? Of course it works better if you do that. History Channel wanted to run on Memorial Day. We didn’t know if we were going to make the paper happen at the same time until the week before it happened. I believed we were going to have to cite the paper as ‘in press’. PLoS said they could really put the work into making it happen — the technical part. It’s cited somewhere that it was pushed through review. That’s not true. But [laying out the paper] was a little bit pushed through to make it happen on the same day. In the end the timing came out perfectly but that was just luck, really.